We’ve been a single-income family for our whole married life. 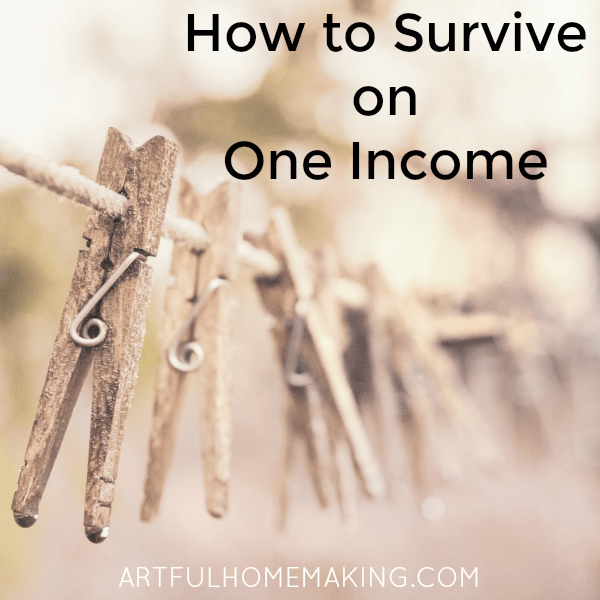 Here are my tips for how to survive on one income. 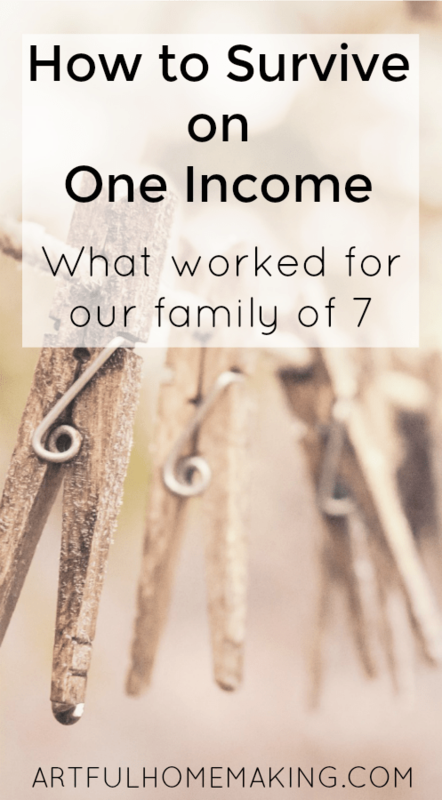 For almost fifteen years our family lived solely on my husband’s modest income. Being able to stay at home with our children and homeschool them has been worth the sacrifices we have made. We’ve endured some pretty lean years, but looking back, we’ve also been extremely blessed, especially by the generosity of others. Here are some of the things we’ve done in order to make it on one income. 1. Only have one vehicle. Up until last year, for the past 16 years, we only had one vehicle. My very generous in-laws gave us a minivan years ago. Then, last year, my husband’s brother bought us a new (used) minivan as a gift. Since then, our oldest daughter got a job and a driver’s license, so she now drives our old van (which might not be her favorite, but at least she has something to drive to work!). I have been cutting all of my family’s hair (including my own) for the past 16 years. My oldest daughter recently decided she would rather have professional haircuts, but she’s the only one who wants to pay for hers, so I still do everyone else’s. We’ve been using TracFone for our cell service for quite a few years now. We started off with a very cheap phone from the Dollar Store and then we buy airtime as we need it. 4. Shop discount grocery stores. We get a large portion of our groceries from bargain and discount grocery stores. This has saved so much on our grocery bill! 5. Eliminate extras like cable and eating out. We haven’t ever had a TV, so cable wasn’t something we needed to pay for. We also try to keep our pantry stocked with basic ingredients so we don’t find ourselves needing to go out to eat out of desperation! If we do go out to eat, it’s usually because we’re away from home or because it was a planned event. We keep a change jar in our closet, and we regularly add our spare change to the jar. It’s always fun to take it to the bank and see how much we’ve accumulated! It’s been close to $100 before, and one especially lean year it even helped pay for Christmas gifts. We don’t use a ton of coupons because we often buy food from stores that don’t accept coupons (like the discount grocery store I mentioned above), we live in a rural area without a lot of choices, and sometimes coupons aren’t available for the type of food we prefer. However, we do use coupons whenever possible, and I may start using them more often! We’re no strangers to garage sales and thrift stores. And we’re not afraid to accept things other people are getting rid of. Our whole living room is full of hand-me-down furniture! I especially love to buy gently used children’s clothing. Kids are so hard on clothes that it doesn’t make sense to buy expensive clothes for them. Try to get your monthly payments as low as possible. We’ve even been able to negotiate with some companies in order to get a lower bill. This is one of the keys to being able to live well on a lower income. We’re currently working toward becoming debt-free, and I so much wish we were at the end of the journey already! I’m always on a quest for more ideas, and we’re constantly scrutinizing our lifestyle to see where we could save more. Do you have any money-saving tips for how to survive on one income that have worked for you? We’d love to hear them!